I was reading an article in the British edition of Country Living Magazine that reminded me I have a very healthy Rose Geranium plant. So I started researching ways to use this herb. There are several recipes online but I found the most information in "Forgotten Skills" cookbook. I started a couple of jars of rose geranium sugar and then made Apple Rose Geranium Compote which I served hot over baked oatmeal. Yummy. Peel, quarter, and slice 8 medium eating apples into 1/4 inch segments. Put them into a stainless-steel saucepan. Add 3/4 cup sugar, juice of 1 lemon, 2 -3 strips of the lemon rind, and 3 - 4 rose geranium leaves. Cover with a parchment paper lid and the lid of the saucepan and cook over a gentle heat until the apples are soft but not broken. 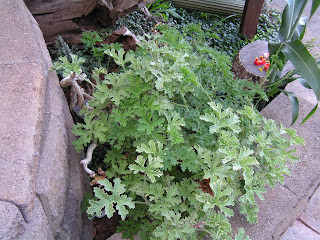 Remove the rose geranium leaves and discard. This compote will keep in the fridge for 5 - 6 days.